Focusing on the essentials and mastering the few settings is the fastest way to learn photography and to know how to use your camera. People often ask me how I expose my pictures. What shutter speed? What aperture? Should I use shutter priority or aperture priority? Spot metering or evaluative metering? Where and how are you setting it? My simple answer: Switch to manual mode. All you need is shutter speed, aperture and ISO. With these three things you can shoot every picture in every imaginable light situation. I think it easier and faster to deal with only three settings instead of studying hundreds of unfamiliar, technical terms. Today I want demystify manual mode and show you how your camera really works. As said before, there are only three settings you have to deal with. Let us start with shutter speed. It allows you to determine how long the light hits the light-sensitive sensor inside your camera. Shutter speed is responsible for two particular things: changing the brightness of your photo, and creating dramatic effects by either freezing action or blurring motion. If you press the shutter release button, a curtain opens in front of the camera sensor so that it can collect the light. You as the photographer can decide how long the curtain will stay open. Essentially, shutter speed is how long your camera spends taking a photo. With this knowledge you can create very interesting photographic effects. With a long shutter speed, typically above 1 second, you can create a sense of speed and motion. Moving subjects in your photo will appear blurred along the direction of motion. Long shutter speeds are also used to photograph the Milky Way or other objects at night. Landscape photographers use long shutter speeds to create a sense of motion on rivers and waterfalls, while keeping everything else completely sharp. The longest available shutter speed on most DSLRs or mirrorless cameras is typically 30 seconds. With a short, fast shutter speed, you can eliminate any motion even from fast-moving objects, like birds in flight. If you use a fast shutter speed while taking pictures of water, each droplet will hang in the air completely sharp. Short shutter speeds are typically measured in fractions of a second. For example 1/4 means a quarter of a second, while 1/500 means a five-hundredth of a second. Most DSLRs and mirrorless cameras can handle shutter speeds of up to 1/4000, while the more expensive ones can handle much quicker speeds of 1/8000 and faster. With a long shutter speed, the camera sensor gathers a lot of light, and the resulting photo will be quite bright. By using a short shutter speed, the sensor is only exposed to a small fraction of light, resulting in a darker photo. This means that you can use the exposure time to determine how bright or dark your image will be. A typical problem that the students at my Wildlife Photography School encounter again and again is the freezing of the movement of animals that are only active during dusk or at night. As you know from the above section, you can freeze movements with a very short shutter speed. No problem in the bright midday sun. But if there is little or nearly no light, you need to use other settings on your camera to make sure there is enough light hitting the sensor despite the short shutter speed. One of these settings is aperture. If you have read the third part of my Learn Photography series or watched the Youtube video, you know that the aperture can be compared to a faucet. The more you open it, the more water flows out of the tap. In other words, you can use aperture to control how much light gets inside the camera. If you want to freeze a movement with a very short shutter speed, you can open the aperture, which is nothing more than a hole that you can make smaller or larger to let in more light. So far, so simple. But there is one thing that extremely confuses beginners: Small numbers mean a large hole (aperture wide open) and large numbers mean a small hole (aperture only slightly open). This is something you really need to pay attention to and get correct. The chart below demystifies the riddle. In photography, aperture is expressed as a number known as the “f-number” or an “f-stop.” Whenever you see an aperture value, the letter “f” will appear before the number, like f/8. When you are dealing with an f-stop of f/8, for example, you can think of it like the fraction 1/8th. Hopefully, you already know that 1/8th is much smaller than a fraction like 1/2. For this exact reason, an aperture of f/10 is smaller than an aperture of f/2. If you understand that, you know what photographers talk about when they recommend a “large aperture” or a “small aperture”. By “large aperture”, they mean settings like f/2 or f/4. If someone recommends you a small aperture, set your camera to values like f/16 or higher. By the way, the favorite aperture of most photographers is f/8. This is one of the “middle apertures”. Just like the shutter speed, aperture can also be used for interesting effects that separates the beginner from the professional. The most obvious effect is the control of brightness and darkness. The further you open the aperture, the more light hits the sensor. A large aperture like f/2 or f/4 can therefore quickly lead to overexposure. If this happens, you can either set a smaller aperture like f/9 or f/16 or shorten the shutter speed. And of course it works the other way round too. If the image is too dark, choose a larger aperture like f/4 or a slower shutter speed. The second, much more interesting effect you can achieve with aperture is to change the depth of field. Your photos can have a “shallow” depth of field, where the background is completely out of focus. Or a “large” depth of field, where both the foreground and background are tack-sharp. Basically, a large aperture blurs large parts of the background. This means that if you want to blur large parts of the background to highlight a particular subject, you set the camera to an aperture value such as f/2 or f/4. If you want a landscape to be tack-sharp from front to back, choose the smallest possible aperture, for example f/22. 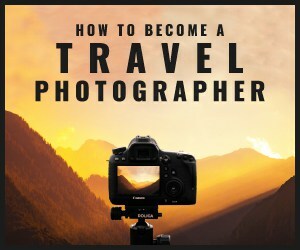 Learn Photography Faster Than Ever And Get Paid To Travel The World! I will teach you the essentials of photography, advanced photo techniques, editing tricks, tips to master mobile photography, and even how to make an income from selling your photos. The third control you should know is ISO. It changes, roughly said, the sensitivity of the camera sensor. Light hitting the sensor is detected by light-sensitive cells. Using the ISO setting, you can adjust the power of these cells up or down, just as you change the luminosity of a living room lamp with a dimmer. If possible, you should always leave the ISO value at the lowest setting, usually ISO100, because raising this value has consequences. A photo taken at too high of an ISO will show a lot of noise. You should only raise ISO when you are unable to brighten the photo via shutter speed or aperture instead. I will explain this with another example from Wildlife Photography School. A student tried to photograph a cheetah in the run. To freeze the animal’s movement, he chose a very short shutter speed. As a result, very little light reached the camera sensor. Because he only wanted the cheetah in focus, he chose a large aperture (f/2) to blur large parts of the background. The sensor still got little light, but the large aperture increased the amount of light, which should result in a well-balanced exposure. In daylight such a picture would not be a problem. But we were out at dusk. The ambient light was not sufficient to get enough light on the sensor. In such a case you can do nothing else but raise ISO. My student got his cheetah with ISO800. This value was sufficient to brighten up the motive sufficiently, at the same time the evening mood in the picture was preserved. Camera manufacturers like to advertise with large numbers. That is why it is important to understand the relationship between noise, megapixels, and ISO. Sensors have a certain size. For example, the size of the APS-C sensor in Canon cameras is roundabout 22 mm x 15 mm. That means it has a surface of 330 square millimeters. The light-sensitive cells are located on this surface. The more cells there are on the sensor, the more megapixels your camera has. A few years ago, manufacturers tried to put as many cells as possible on the sensor. A huge number of megapixels guaranteed lots of sales. However, the closer the cells are to each other, the more likely it is that there will be undesirable electronic interferences between them. These interactions generate the noise in your photos. For this reason, a Canon APS-C sensor with 16 megapixels can be better than a sensor of exactly the same size with 24 megapixels. The cells are further apart, the probability of interferences is lower with the sensor with fewer pixels. After large megapixel numbers no longer sold cameras because photo magazines informed potential customers or because buyers frustratedly returned their cameras, the marketing managers looked for a new thing that they could advertise with large numbers. As you might guess, they found the ISO. I have seen offers promoting cameras with ISO 20.000 and more! If you turn the power of the diodes extremely high, you will get electronic interferences, what means noise in your images. This happens when the diodes are too close to each other, but also when they are further apart and run at more than maximum power. How much ISO is the absolute maximum? If you want to get absolutely noise-free images, you should set the ISO value for cameras with an APS-C sensor to a maximum of ISO 1.600. This is a physical limit. Do not let salesmen and self-proclaimed “experts” on the Internet tell you anything else. If you have a full-format camera, you can go up to ISO 3.200. Why? Because the sensor is twice as big. Here, too, science kills all myths. In the next part of my series Learn Photography Faster Than Ever I will explain the connection between shutter speed, aperture and ISO more detailed. You will get to know the “magic photo triangle” and learn how you can shoot perfect photos in every light. By the way, if you need somedeeper advice, a personal mentor may guide you through all aspects of photography. In our Travel Photography Masterclass you can look over the shoulder of a professional photographer who has worked for the BBC, National Geographic and many other well-known media. Just click on this link for more information.